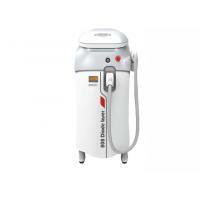 and protect skin from being hurt and reach a very safe and comfortable treatment. 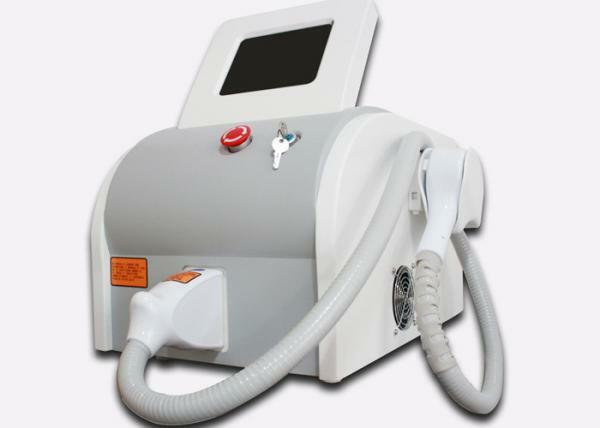 2) High power 808nm diode laser, easily to hair removal, no pains, feel cool and comfortable. 3) The sapphire contact cooling system cooling patent technology security, no damage to the skin. 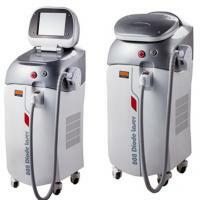 5) Treatment faster than IPL and long pulsed laser. a)Cooling: when operator does not shot with handpiece, the cooling degree will automatically come to “0” in 2 minutes. b)Water temperature: operator could adjust a temperature number like 35 centigrade. When machine temperature reaches 35 centigrade, machine can not shot and should have a bit rest. c)Water flow: If water flow is not smooth, the icon of water flow will be red. 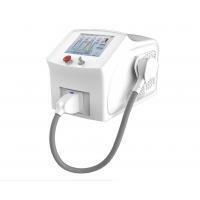 d)Handpiece: If handpiece is not well connected, the handpiece icon on screen will be red. 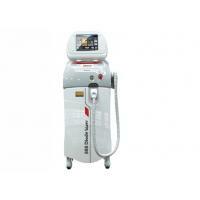 a)Skin types: There are total 6 skin types, operator could choose different skin types for different treatments. Meanwhile, operator could also save the parameters of these skin types. b)Intensity: It’s from 3 to 40 J/sqm, which is real and low level. c)Frequency and energy: This 2 parameters are inverse ratio. Energy becomes higher, the frequency is lower by itself. 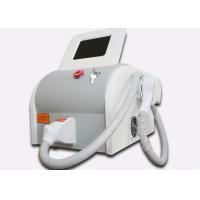 This is to avoid high energy + high frequency to burn skin. 3,Handpiece: Germany imported micro channel bar, which could reach 15 millions shots. a)The maximum shot number could be adjusted by software, distributor could add the maximum shots, which is good for distributors to sell more handpieces. b)There are 6 languages for customer to choose. a)Ion filter from Korea ensures the ion density in the water at zero. Delivery method :we can offer the door to door services by air or by sea, just depend on your actual request. Such as DHL, UPS, TNT, FEDEX… by air; and the sea transportations. Delivery time :Within 4 working days after your payment. Package : Strong and beautiful aluminum alloy case with sponge mode inside. Payment:T/T, Westen union, ESCROW,Paypal,Bank Transfer,Cash or Contact us. Your inquiry related to our products or prices will be replied in 24 hrs. 2.Well-trained and experienced staffs to answer all your inquires in fluent English. 3.OEM&ODM, any your customized products we can help you to design. 4.Distributorship are offered for your unique design and some our current models. 5.Protection of your sales area, ideas of design and all your private information. 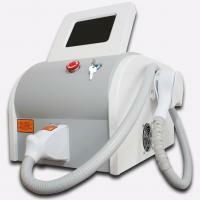 Once you buy our machines,we supply professional training for you. Detailed user manual and online service are training basis. 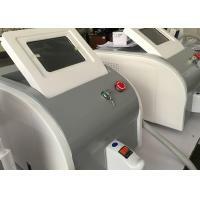 Moreover, we could teach step by step about machine usage and treatment operation according to your need.Online service will be always provided after training finish. We have been dedicating ourselves to the development, production and service of optical beauty and medical equipment. We promote development of optical beauty industry with high-tech creation and keep introduction of the most internationally advanced technologies so as to guarantee international quality in technical content of each products. Innovation is endless. Our company has stepped further hand-in-hand with top well-known scientific research institutes and yielded new achievements in laser application field: LED, IPL, RF laser and microwave. We will make great efforts to build up top-level brand in beautification industry and laid a solid foundation for your beauty career. Everything is based on customers' demands. Exquisite technologies, professional training and considerate services are combined to adequately personify each product, to increasingly perfect techniques, and to bring your hearts closer to our hearts. 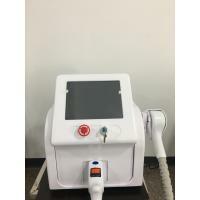 In 2003, Shanghai Fano relied on the Laser Institute of the Chinese Academy of Sciences in Beijing to establish the first beauty equipment factory in Shanghai. In 2005, China developed the first photodynamic L800, eight years earlier than the Korean company. 2008 China's first TM700 (SHR), breaking the US technology monopoly. In 2009, the company cooperated with the French team to launch the world's first eye project instrument, intelligent eye health management system. Strong R&D customization ability. Since year 2003, OEM & ODM machines have been continuously supplied to Germany, Japan, USA, France, Italy, Spain and Australia. 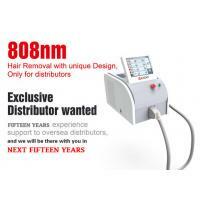 Provide high quality machines and professional services to 180 worldwide distributors and 2,000 beauty salons. Certificate, domestic medical production license, ISO13485 certificate, product quality reach international standard. For agent, 3 days delivery, for other customer, 7 days delivery. Professional teachers go to the store for training, and provide operating instructions, maintenance service manuals, operation videos, online training and other services. 24-hour online service, giving customer solutions within 12 hours.